Huge city walls facing the land and sea met the Vikings when they sailed in to Constantinople mooring at the harbor in the Golden Horn. 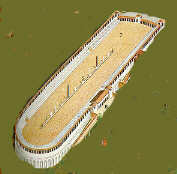 In this city of several hundred thousand, the Hippodrome with room for 100,000 spectators dominated. It was the eastern Roman Empire's ceremony and festival center. From here the emperor proclaimed his decisions and issued decrees. Above the entrance were four horses in bronze telling what the hippodrome was actually built for. Nearby was the largest church in the world, Hagia Sofia - The Church of Holy wisdom. It was finished in 537 and was therefore quite new when the Vikings arrived. We know that the Vikings visited the church because on one of the columns you can still read "Halvdan was here" etched in the marble in Runic symbols. Halvdan was surely impressed when he gazed at the huge cupola which soared to 56 meters above, even though he didn't understand much of the ceremonies that were taking place on the church floor. In the senatorial building there was room for 2000 senators, together with the splendor of the royal palace it is not so strange that the Vikings referred to the city as Miklagard (The Great City).